Disclosure: I’m a member of the Kraft Tastemakers—a community of kitchen aficionados contributing my recipes and stories to KraftRecipes.com. Kraft compensates me for my time and provides me with materials to make the lovely dishes you see. My stories, my opinions, and my tastes are my own! I live in sunny Florida and during the summer’s hot weather my family craves for desserts like this Tropical Melon Jello Dessert which is my latest recipe published at Amigas de Comida Kraft. 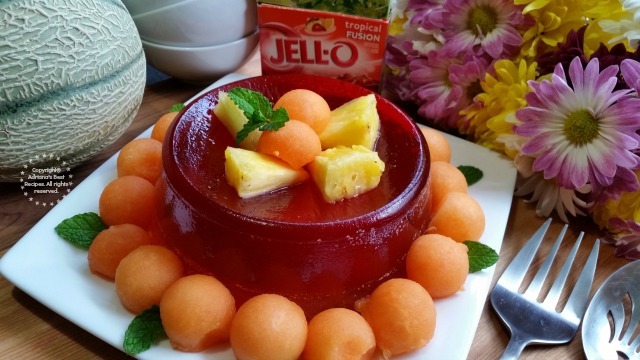 This recipe is very easy to make and has as the main ingredient JELL-O Tropical Fusion flavor gelatin combined with fresh fruit in season, such as cantaloupe and tropical pineapple which both make a great pair and represent very well my latino culture and the sweet flavors of my Mexican cuisine. This tropical melon jello dessert is full of flavor and color and makes a great addition to any menu because a meal isn’t complete until we have dessert, right. Having sensible desserts in our table is very important while treating our family and our sweet tooth, and have found that fresh JELL-O is a good and refreshing option to fulfill those dessert cravings. 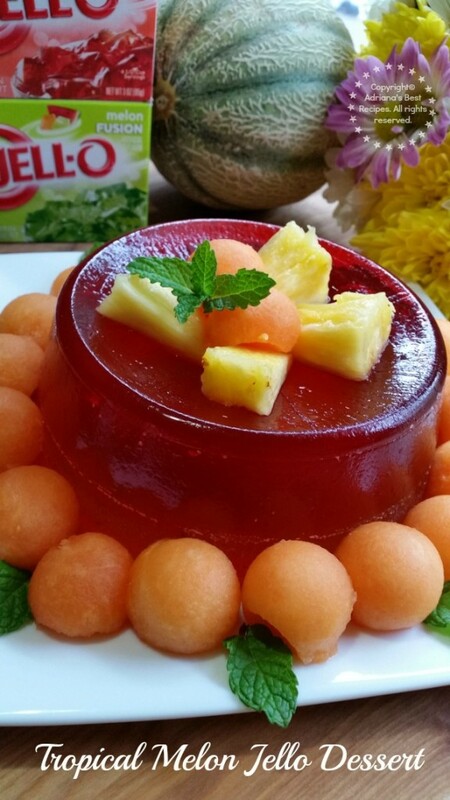 If you are into snacks, a dessert like this Tropical Melon Jello is a welcome treat and another way to offer fruits to those picky eaters at home. 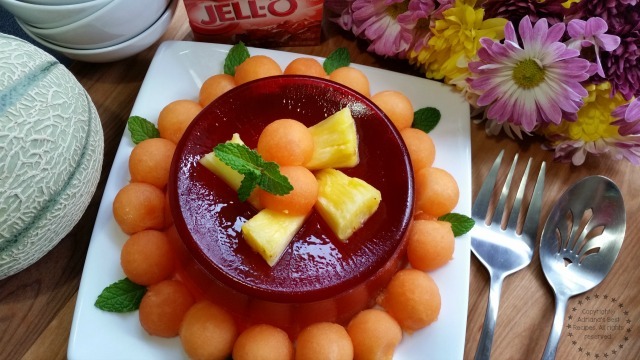 Using fruit cutters and gelatin molds you can create a masterpiece that is attractive to the eyes and invites those difficult eaters to try a bite. 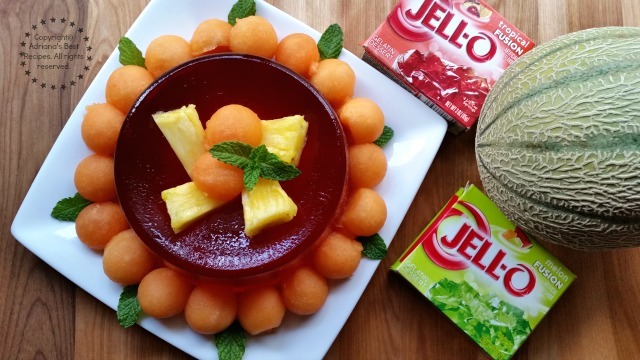 This recipe for Tropical Melon Jello Dessert is inspired in the gelatin desserts I was used to preparing with my dear Aunt Minita, who was an expert in gelatin desserts using innovative flavors and fruit. I learned from her the attention to detail and the discovery of new flavor profiles while transforming traditional family recipes and using brand name products like those offered by KRAFT. I invite you to visit Amigas de Comida Kraft site and get all the recipe details for making this Tropical Melon Jello Dessert. I am a huge fan of snacks and jello, too. Here in my country, jello desserts and gelatin are usually part of fiestas. I don’t eat melon though but that jello dessert just looks glorious and it may just make me eat melons. We all love Jello in our home. Your recipe looks so refreshing, easy to make and appetizing to all ages! Thank you for sharing. Me encanta esta receta, porque me gusta Jello pero me aburre hacerlo de la misma forma, esta receta me inspira. Genial! My kids love Jello. Their favorite is the cherry flavor. Thanks for sharing your recipe. Me encanta la gelatina y con frutas es ideal para este tiempo.. Gracias amiga. That looks so delicious! Perfect for summer! That is perfectly summery and so very lovely! I may bring this to a summer picnic this year. Muy refrescante para el verano! Muy buena idea para los días calurosos, gracias por compartir! This looks good. I remember my mom used to mix jello and fruit cocktail or something like it. It was good. Qué deliciosa gelatina, también me encanta agregarle fruta, ya que en casa la pequeña esta en la edad de la rebeldía y no quiere comer frutas, ni verduras jejee… 😉 Muchas gracias por la receta Yummy! This looks so fancy, but like I could probably do it. I’d love a slice of it!